This lesson provides an understanding of tort liability, risk management principles, and techniques for monitoring and evaluating existing facilities and programs. Key definitions are provided, along with information on litigation trends, exposure evaluation methodologies, successful risk–reduction strategies, and case study examples. Students will study real cases that illustrate the importance of considering human performance in planning and design and of the role facilities play in creating predictable behavior. An understanding of tort liability and risk management issues will alert the designer to the need for evaluation and monitoring on an ongoing basis and for creating built–in feedback systems. More and more lawsuits are being settled against government entities that adopt a do–nothing posture. Identifying potential risks, doing something, and then evaluating the results as part of a systematic program is proving to be a more defensible approach. 22.2 Tort Liability for Bicycle and Pedestrian Facilities. 22.3 Trends and Example Cases. 22.5 Cases That Lead to Quick Settlements against a Government. 22.6 Risk Assessment and Management. 22.8 References and Additional Resources. To an increasing degree, issues of risk management and tort liability are becoming major determinants of planning, engineering, and implementation programs for bicyclists and pedestrians. Agency concerns about potential liability can either lead to innovation and substantially improved facilities and programs, or they can lead to a do–nothing approach. Ignoring risks does not make them go away. Taking systematic steps to identify and evaluate risks and to develop an effective risk management program are essential measures, even if your agency cannot afford to remedy all problems immediately. Without a well–conceived and well–implemented risk management program, the courts become de facto policymakers. Highway engineers, designers, and planners must consider the needs of the pedestrian and bicyclist. Design of streets, bridges, surface conditions, maintenance, and operations must be all viewed differently with the increasing importance of bicycling and walking to people of all ages. The very young, the old, and the disabled rely on walking and bicycling for everyday transportation and exercise. Highway and recreational facilities that fail to fully incorporate the needs of all users increase the likelihood of potential court settlements in favor of those who are excluded (see figure 22–1). Since most highway professionals are not routinely trained to design for pedestrians and bicyclists, mistakes are common. The result is increased risk, which is often not identified until crashes occur. Training is especially important since some engineers and planners do not bicycle or walk extensively under the conditions for which they design. Figure 22–1. Photo. Courts have become less sympathetic to agencies that do not consider the needs of pedestrians and bicyclists. Just how significant is the liability issue? Hasn’t this whole thing possibly been exaggerated? How much money is really involved? It has been reported that the total dollar amount of claims against U.S. highway agencies in a typical year is between $50 and $60 billion. On average, State agencies faced about 80 lawsuits per year. City and county departments faced about three per year. About 7 percent of all lawsuits against State agencies required a settlement by the State; however, 50 percent of lawsuits against city and county agencies required a settlement cost. The average settlement cost was $60,000 for State DOTs but $230,000 for city and county transportation departments. The average cost to defend a tort liability lawsuit was about $70,000, with little practical difference between state costs ($68,000) and city and county costs ($72,000). The United States is experiencing an increase in tort liability claims. The public and its officials can and should demand fairness in settlements; however, it is unlikely that a dramatic reduction in charges and complaints will occur. More lawsuits are being filed. Legal action is becoming broader in its scope, with suits against nonprofits and the families of those affected, as well as agencies and individuals. Government, well–insured corporations, and professionals continue to be favored targets due, in part, to their perceived deep pockets and ability to pay. There is a tendency toward increased liability in areas that once had some degree of immunity, with a continuing rise in the size of claims. Insurance companies often settle rather than defend. People with a litigious bent are encouraged by the knowledge that insurance companies often settle quickly rather than bear the time and cost of defending themselves against relatively low–dollar claims. The courts are, in this way, taken out of the process. The knowledge that even a frivolous lawsuit may net someone $50,000 to $100,000 provides a strong incentive to sue. In a crazy world, risk management is here to stay. It is important that agencies and organizations understand this fact and structure their actions accordingly. Most in the transportation community understand that planning and highway professionals work hard to address traffic problems, improve safety, save money, keep people and goods on the move, and meet many other praiseworthy goals on behalf of the public. But do the public really understand the parameters within which these professionals work? Do the public support their objectives? Do they know the limitations the professionals face—the schedules, budgets, and political pressures? Do they care? In some cases, it is a struggle to build and maintain the public’s confidence in the work of government. It is all too easy to blame mishaps on the bureaucracy and to take them to court if the opportunity arises. When someone travels a roadway or a trail on a regular basis and a crash occurs, they generally look beyond themselves for someone to blame. It is tempting to pin responsibility on the faceless public agency most directly involved in design, maintenance, regulation, or operation of the facility. Not only may people file lawsuits, but also they may become publicly critical of the agency and its programs. They become less likely to endorse budget increases and bond issues. If asked to serve as jurors in tort cases, they recall the negative experiences and perceptions and may filter facts through this bias. Implementing an aggressive and well–publicized risk management program can help head off these problems. An effective first line of defense is to build and maintain public confidence; to protect budget allocations for needed public works projects; and to foster a spirit of cooperation, not confrontation, between public and private sector parties. Today, the newspapers and electronic news media frequently headline court settlements against public agencies that have allegedly failed to use good judgment or carry out their professional responsibility on behalf of public health, safety, and welfare. Some settlements now soar as high as $10 to $14 million for a single injury. Even minor lawsuits (which may be settled for as little as $5,000) may require $10,000 to defend. The examples that follow illustrate conditions that can lead to pedestrian and bicyclist injury. In these first two cases, the government was sued for an injury to a pedestrian or bicyclist on a facility that was specifically built to accommodate bicycling and walking. Example Case 1. An attorney was riding a bicycle on a sidewalk that was previously marked as a bicycle path. He did not slow down when approaching a residential driveway on a semiblind corner. He ran into a motorist exiting the driveway, hitting the car in the middle of the front–door panel. The bicyclist sued the motorist and the condominium owners for $750,000. The bicyclist will have a tough time proving that he was not guilty of contributory negligence in this case. Since he hit the middle of the car, it can be argued that he had plenty of discovery time, had he been paying attention and riding in a reasonable and prudent manner. The car was moving very slowly, stopping to check for traffic and entering the street. The bicyclist’s view of the driveway was partially blocked by a perimeter wall around the condo complex. Signing any sidewalk as a bicycle path increases the likelihood of tort settlements even years later. Designating a sidewalk for bicycle use sends the message that it is safe to ride there. Sidewalk facilities have built–in traps for the unsuspecting. 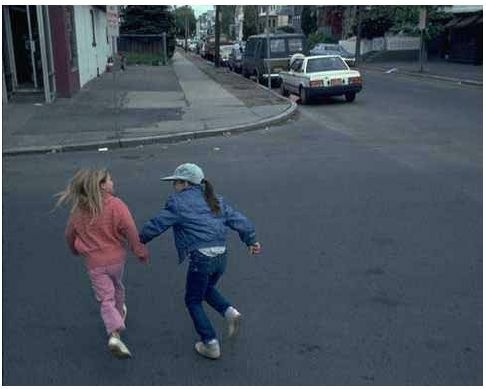 Sight–distance problems at intersections with streets, driveways, and alleys are common on sidewalk facilities. Most local zoning ordinances allow construction of rear and side yard walls to a height of 1.8 m (6 ft) on the rear and side property lines. 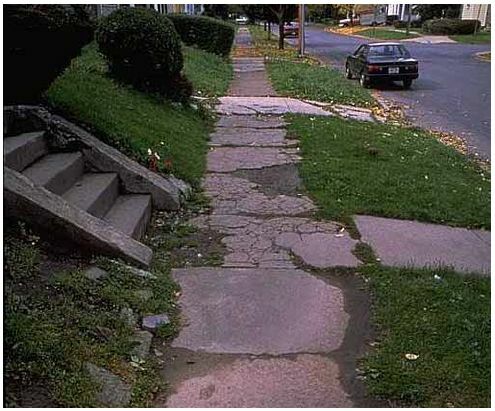 Since sidewalks are often located very close to rear or side property lines, especially in residential areas, walls on these property lines seriously limit sidewalk views for intersecting motorists. Motorists expect pedestrians on sidewalks, not bicycles moving 10 times as fast. Bicyclists, with the wind in their ears, on two–wheeled vehicles, are not as sensitive to noise cues as pedestrians and not as maneuverable. It takes them much longer to react and stop. Since sidewalks have historically been regarded as pedestrian zones, the pedestrian movement pattern of two–way traffic prevails. Bicyclists using the sidewalk often think this applies to them too, and ride against traffic. They don’t see stop signs at cross streets (located to be seen by motorists on the other side of the street), and they are not part of the normal scanning pattern for motorists. A person waiting to turn right will scan to the left for oncoming traffic, wait, and then move quickly to take advantage of a gap. At first, he may take a quick look right to see if a pedestrian is coming, but he seldom looks back. A fast–moving bicyclist can easily escape detection and a crash can result. For these and other reasons, sidewalks are not recommended for designation as bicycle facilities. Example Case 2. A wheelchair user is traveling along a sidewalk. The sidewalk is discontinuous, with an unpaved stretch of about 45 m (150 ft). To get around this, the wheelchair user moves into the street, going against traffic, gets stuck in sand on the shoulder of the road, and falls over. He can’t get up until a passer–by helps him, setting him upright, and pushing him through 45 m (150 ft) of sand to the continuation of the paved sidewalk. The wheelchair is damaged and the person is injured. The pedestrian sues the city, claiming negligence, and wins. The lesson learned here is to consider all users. Examine your community for these sorts of hazards and institute an aggressive retrofit program. The city was said to have led the wheelchair–bound person into a trap. A continuous paved surface should be provided or warning sign posted well in advance. Doing nothing is not a viable option. In the two examples that follow, injuries occurred because a government did not take action to correct a potentially hazardous situation. More and more governments are being sued for failing to recognize public needs and taking actions to meet them. Example Case 3. A pedestrian is walking along the sidewalk on a one–way street, facing the flow of traffic approaching a signalized intersection. Because the traffic signals are positioned to be seen by oncoming (one–way) motor traffic, the pedestrian can see neither the motor vehicle signal nor the pedestrian signal (i.e., WALK & DON’T WALK indications). He hesitates until he thinks he has a green light and then steps out into traffic. After getting partway across, he realizes that he has made a mistake, turns around suddenly, is hit, and injured. The pedestrian sues the city and wins. The city did not provide pedestrian–oriented traffic controls. The lesson learned in this case is to consider all users. Examine your community for these sorts of omissions and institute an aggressive retrofit program. Example Case 4. On a bridge that provides the main linkage to downtown, the surface is badly broken up, the pavement has deteriorated on the decking, and seams have been patched over, leaving dangerous ridges (see figure 22–2). This bridge is known to be heavily used by bicycles, and the city has written to the State three times asking that the bridge be repaired due to the potential hazard. Because of these and other hazards, bicyclists cannot ride too near the curb and crowd the motorists in narrow lanes. The State has not responded, despite repeated requests for action. Figure 22–2. Photo. 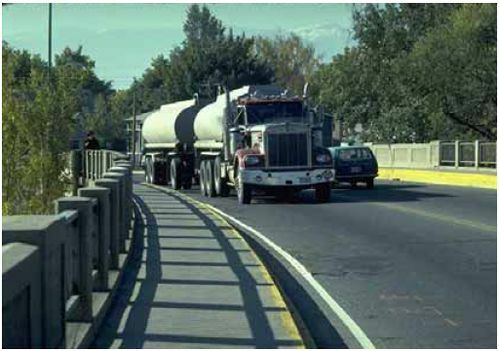 Bridges are a recurring theme in many tort liability claims. A semi–tractor–trailer left his air brake on. As he approached the bridge, he released his foot, activating the brake, which caused a loud noise. A 23–year–old woman bicycling across the bridge heard the noise behind her and moved closer to the curb. The trucker once again activated the brake, causing another loud noise as he approached the bicyclist. The bicyclist panicked, rode into the curb, fell, and was killed by the truck. The bicyclist’s family and the truck driver’s insurance company both sued the State. Because of the letter written by the city and the length of time the condition had been present, the State settled out of court. In addition to the poor pavement conditions, it was found that the bridge sloped slightly to the right and the State had, over time, let the centerline of the roadway drift toward the right. The right–hand lane was 4.0 m (13 ft) wide, while the left–hand lane width was 5.2 m (17 ft). The bicyclist was forced to share a dangerously narrow lane with both hazardous pavement conditions and heavy truck traffic. The lesson here is to take action promptly in response to identification of hazards, even if it means only the interim measure of posting warning signs until the correction can be made. The issue of risk management is becoming a major factor in decisions about implementation of capital projects and programs. The high costs associated with risk management have, in some cases, meant that things simply are not built or programs are not funded. Decisionmakers are becoming gun–shy. Ignoring the problem, however, does not make it go away. As stated earlier, governments are just as often sued for what they do not do as for the actions they do take. The best approach is to develop a strong, proactive program to plan, design, build, maintain, and operate a fully balanced transportation system that responds to the needs of all potential users (see figure 22–3). The program must be based on a diligently applied set of defensible standards and a public process that allows involvement by all affected parties. It is very important that an agency be able to demonstrate it is aware of potential problems and is taking systematic steps to address them. Figure 22–3. Photo. The needs of all users, young and old, should be considered in transportation planning and design. To negotiate the legal minefields successfully, a basic knowledge of several terms is useful. This section defines and provides examples for concepts such as tort, proximate cause, negligence, and sovereign immunity. A tort is defined as a wrongful act, not including breach of contract or trust, that results in injury to another person’s property or the like and for which the injured party is entitled to compensation. When an individual is harmed by another party without criminal intent, he or she may be able file a tort claim. The tort claim must be based on establishing that the party had a duty to perform relative to the injured individual and that this duty was not performed with ordinary care, in a reasonable and prudent manner. An injury resulting from a breach of contract or trust does not fall within the definition of a tort. Example Case 5: A 32–year–old mother of three was permanently disabled when she lost control of her bicycle, went off a multiuse path into a drainage ditch, and fell. Her back was severely injured when she struck a rock on the far side of the ditch. It was found that the bicyclist was not warned of the potential hazard and thus was surprised by it. Once she went off the path, there was a trap in the recovery area. The assumption that design for low–speed use only was acceptable was found to be invalid. The city was responsible to design for expected speeds and could have been found at fault in this case. How could the path have been designed to minimize the chances of this type of crash? The path was originally designed as a pedestrian walkway and later designated as a bike path without modifying it to bring it into conformance with AASHTO or other accepted design standards for multiuse facilities. 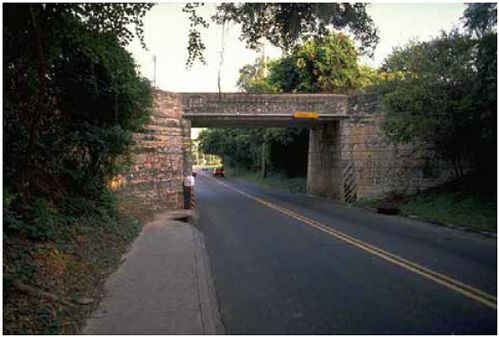 (2) When it was built, the path met current standards for pedestrian use. The cost of rebuilding it to accommodate bicycles was thought to be excessive by the city council and signs were simply added to the existing path. The rationale for this action was that the path was meant for recreational use and that improving it to AASHTO standards would encourage high–speed bicycling that would endanger pedestrians. It was thought that the narrow width and tight turns would force bicyclists to ride slowly and use caution. The edge of the path dropped off directly into a culvert, with no shoulder provided. Swinging a little wide on the turn and having no available recovery area, her tire dropped off the edge of the path into the culvert, and her bicycle flipped, sending her flying to the far side of the drainage ditch. If the substandard radius on the curve had not caused a loss of control, and if the bicyclist had been able to see how tight the curve would become, and if the culvert had not been in the curve alignment, then the crash might not have occurred. The substandard design, then, is viewed as the proximate cause of the injury. Proximate cause must be proven to establish negligence in court. The city maintained that it was not designing for the high–speed bicyclist, but for the novice recreational rider who would not go fast. The courts found this position to have contributed to the cause of the crash. This contributory negligence often results in rulings against settlements favorable to the defense. How could the path have been designed to minimize the chances of this type of crash? Designers need to anticipate use by all types and ages of travelers—motorists, pedestrians, bicyclists; young, old, disabled, or hale and hearty. Only by understanding pedestrian and bicyclist behavior, perceptions, and operations as well as most traffic engineers understand motorists can these problems be avoided in the future. Was there a potentially dangerous defect? Was a defect a proximate cause of the crash? Was there contributory negligence on the part of the bicyclist or pedestrian? Did the agency have knowledge that the condition existed? Were the agency’s actions discretionary or ministerial? How is a judgment of negligence against government won? It is not easy to prove negligence within the context of the five conditions specified above. However, negligence must be proven if a judgment is to be won. The example that follows is taken from an actual case where negligence was alleged. Example Case 6. The Florida DOT (FDOT) was charged and tried in a civil court for negligence as a result of a bicyclist falling on a bridge (Miller v. FDOT). The bicyclist’s wheel fell into a bridge counterweight slot. The rider was pitched forward, sustaining serious facial injuries on the grating. The rider was a professional model and an experienced bicyclist. She brought a tort charge against the State, which had to be defended. The bridge was built more than 30 years ago, before bicycling became popular. There was no designated bicycle facility on the bridge. The bicyclist was riding to the far left of the lane. Was this a legal location for the bicyclist? Was this position within a narrow lane a logical location? Did the bicyclist have sufficient discovery time to see and avoid the slot? Could an adult with eight years of bicycling experience, one who served as a ride leader and had ridden this route a dozen times previously, have anticipated this danger? Considering your answers to these questions, can the five conditions necessary for negligence be proven? FDOT had a duty to design, operate, and provide maintenance services for the bridge. The open counterweight slot constituted a maintenance condition. The government had a duty to maintain and operate a safe road for all users. Furthermore, FDOT had a duty to warn the public of an unsafe condition and had failed to do so. It was argued that the agency knew that bicyclists used this bridge and that there had been previous bicycling crashes on this grating that were associated with this slot. The open slot had been previously reported as needing correction, but the correction had not been made. It was argued, therefore, that FDOT had not carried out its duty in a responsible manner. 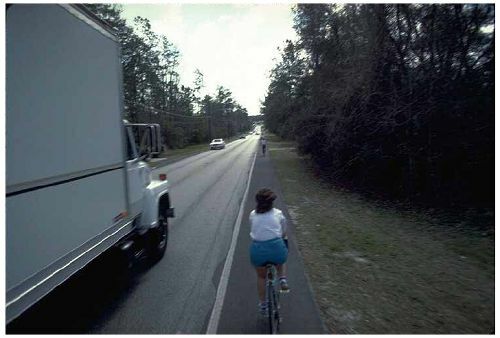 Even though the correction had not been made, FDOT could have warned bicyclists of a potential hazard. The slot was the proximate cause of the crash. The bicycle wheel fell through the slot and precipitated the crash. The bicyclist may have significantly contributed to the crash (been guilty of contributory negligence) because: (a) she was riding in both an illegal and illogical place on the roadway; (b) she was riding too fast for bridge conditions; (c) she rode this route at least weekly and should have been aware of the hazard; (d) she was riding directly behind another bicyclist so she did not see the slot until it was too late to take evasive action; and (e) she was an expert bicyclist with eight years of experience who served as a ride leader and officer in a bicycle club that used this route weekly; as a leader, she had a responsibility to know and alert others to potential hazardous conditions along the route. The bicyclist, a professional model, suffered severe facial damage. The damage claims were found to be real and significant. A $250,000 settlement was awarded. Ordinary care is defined as the level of care that a reasonably experienced and prudent professional or other individual would have taken in the same or a similar event or action. Ordinary care is distinguished legally from extraordinary care, which parties are not expected to meet. Standards for separating ordinary from extraordinary are based on the expectation that 85 percent of travelers operate in a responsible manner (the 85th percentile rule). Highway professionals are charged to design, operate, and maintain highways for the reasonably prudent traveler. Example Case 7 In a private development, a bicyclist transporting a child crashed into a second bicyclist, also transporting a child. One bicyclist was approaching a blind corner leading into an underpass from a lateral path providing street access to a greenbelt path. Because of limited clearances within the underpass, the bicyclist rode toward the middle of the underpass. He did not see the other bicyclist (approaching through the underpass from the opposite direction) in time to avoid a crash. The case was settled against the private developer. It was argued in court that motorists on the bridge above were given the advantage of full design, signing, and operations treatments based on AASHTO standards, but the bicyclists in the underpass below were left to "fend for themselves" in an abandonment of design principles. In this case, the project designer did not offer the same level of care for the bicyclist and pedestrian as was offered to the motorist. This case demonstrates the principle that the needs of all potential users must be given equal weight. Immunity is defined as legal protection from court settlements. Sovereign immunity indicates that an agency is not required to pay settlements. Partial immunity puts a cap on how much can be awarded or limits exposure to certain areas, such as maintenance and operations. Today, most States and some counties have limited immunity. Florida, as an example, has a maximum settlement amount of $250,000 per incident. If the courts award a settlement in excess of this amount, the plaintiff has to appeal before the legislature for the difference. Very few States still have full sovereign immunity, where a plaintiff must request a waiver to win a government settlement. Some States allow lawsuits, but specify that they must be filed within a short period of time following the injury or limit the amount of the suit. Consultants and corporations have no immunity. Nonprofit corporations are losing the immunity they once had. Individuals seldom have immunity. To date, few lawsuits have been won against the Federal Government, although many suits are filed. An example of this type of case is Coleman v. U.S.A., in which the National Park Service was sued for a bicycle crash that occurred when a bicyclist crossed the centerline of a roadway to pass other riders during a large, mass bicycle ride. In moving left to pass, he hit a concrete seam along the center of the road at an oblique angle. His wheel caught the seam and he went down. Although this case is still pending, the National Park Service is saddled with the expense of a defense. Design decisions may have protection, but maintenance and operations do not. Certain actions have full or partial immunity from legal action. As a general rule, governments still enjoy some immunity in the area of design, although this, too, is eroding. There is little immunity for actions related to operations or maintenance. Lawsuits relating to signing, warnings, surface conditions, poor maintenance, and similar factors are among the most difficult cases to defend. Example Case 8. A well–educated adult bicyclist, riding in the correct direction on a bicycle lane, suddenly swerved left into the traffic lane, where he was hit broadside by a car going 88 km/h (55 mi/h). He was thrown 36 m (120 ft), landed on his head, and sustained severe brain injuries. In this case (Boyd v. Illinois), the lawsuit was filed against the bicycle manufacturer and the construction company, since the State of Illinois refused liability under legislative immunity. In this case, the bicycle lanes are on a highway bordered by steep cliffs on one side and a river on the other. On the river side of the highway, maintenance of the lane is so poor that many bicyclists opt to ride against traffic, along the cliffside lane, where the surface is in much better condition. They prefer to take their chances with oncoming traffic rather than risk a fall from broken pavement and the ever–present gravel, dirt, and debris along the river. The cliffside bicycle lane is routed within the narrow zone between curb and motorway. This zone traps a 0.6– to 0.9–m (2– to 3–ft) wide pile of debris and sediment, especially after storms, leaving a perilously narrow strip for bicycle movements. The bicyclist in the example lost control when a wrong–way cyclist suddenly challenged him for his narrow portion of the lane. Poor design (curbing and low–grade surfacing and construction quality) in this case led to a poor maintenance condition on both sides of the highway. The extremely poor maintenance on the river side led to an operations problem when bicyclists routinely elected to ride against traffic to maintain their stability rather than cope with the dangerously deteriorated pavement along the river. Open drainage grates in the traveled way. Lawyers refer to these as "waiting traps." Much research has been devoted to analysis and design of bicycle–safe, hydraulically efficient drainage grates. Temporary solutions are simple and cost effective. If the grate cannot be replaced immediately, it can be rotated 90 degrees or temporary strips can be welded across it. It can be marked as a potential hazard. Paths that end suddenly at hazardous locations with no transition or escape route provided (see figure 22–4 for an example). In court, you will hear that these paths "lead the customer into a trap." All facilities should be ended logically, with a reasonable warning (e.g., "Path Ends"), a transition to an alternative route, and some design precautions taken so the inattentive path user is not launched off a cliff, slammed into a barricade around a blind corner, or otherwise penalized too harshly. Figure 22–4. Photo. Example of a sidewalk ending at a bridge abutment with no warning or alternative path. Inadequate curve radii Many designers are not aware that speed, not vehicle design, is the sole determinant of the proper radius of curvature. A bicycle and car going the same speed, say 30 km/h (20 mi/h), each need a 29–m (95–ft) horizontal radius for turning. If anything, the bicycle needs a slightly wider path in a curve, since bicyclists lean into a turn, taking up slightly more space. Design speeds of 30 km/h (20 mi/h) on flat terrain and 50 km/h (30 mi/h) for grades up to 4 percent are recommended by AASHTO guidelines. Long–term, severe surface irregularities. The longer that surface irregularities (such as broken pavement, potholes, raveled edges, bumps, seams, and gutter–edge buildup) are left unattended, the greater is the potential exposure and the more difficult it becomes to convince a jury that you did not know the condition existed. The jury will be convinced that the condition was discoverable and you may be found negligent. Poor sight distances. Like motorists, bicyclists need time to identify and react to potential hazards, such as tight turns, obstructions in the traveled way and intersecting motor vehicles, pedestrians, and other bicyclists. At least 6 seconds of discovery is needed to allow adequate reaction time, mechanical set–up, and braking to a stop. At 32 km/h (20 mi/h), this is a distance of 54 m (176 ft). Walls and vegetation most often block views, but sometimes, sight distances can also be limited by steep hills (cresting sight distance) or curves on steep grades. These problem areas should be identified, with warning signs installed and/or obstructions removed. Roadway design, planning, operation, and maintenance that do not consider bicycle and pedestrian use. It is no longer acceptable to plan, design, or build roadways that do not fully accommodate use by bicyclists and pedestrians. The bicycle is seeing increased use for transportation and the health benefits of walking are receiving greater attention. More than twenty years of experience have passed in designing for bicycles in the United States, with millions of dollars devoted to research and planning. With every passing year, the courts become less and less sympathetic to agencies that have not understood the message: bicyclists and pedestrians are intended users of the roadway. Transportation staff must be knowledgeable about planning, design, and other aspects of nonmotorized travel. All modes must be taken into account. Bridges and underpasses that are hazardous to bicycles and pedestrians. Like motorists, bicyclists need to cross bridges to get to some destinations. Bridges are expensive to build and difficult to retrofit for bicycling. Bridges have many surface conditions, maintenance problems, and operations problems that must be dealt with. A facility of any length is only as safe as its weakest link—often the bridge. Poor maintenance of off–street facilities. Many agencies have been successfully sued when people slip on gravel, sand, grass clippings, standing water, deteriorating pavement, and similar conditions. Bicycles are particularly sensitive to litter, debris, and other materials. An aggressive maintenance program is essential for all designated facilities. Methods for identifying and correcting problems should be developed in a timely manner. Nonstandard traffic control devices. The MUTCD and similar manuals adopted by many States establish industry standards for installing signs, traffic signals, and pavement markings. (3) When traffic control devices conflict with or are not supported by existing standards, the liability is greater. Certainly these standards manuals like the MUTCD cannot address all possible situations or issues; where they do not, it is best to demonstrate that reasonably prudent judgment and engineering principles were used in the absence of specific standards. Document the scope of your specified duties. For each type of duty, prepare a detailed list of the actions involved in carrying it out. Do some homework. Research the crashes and lawsuits that have occurred in your community. For each action, document or develop a reasonable standard or set of criteria to be followed, taking into account their impact on all potential users. Systematically evaluate your present programs and facilities according to the criteria and standards defined for each action. This process should provide a good idea of the strong and weak points of your programs and facilities and an overall picture of your level of exposure. By working thoughtfully through a systematic analysis of what it takes to carry out your assigned duties and a realistic assessment of how well programs and facilities measure up to accepted standards, you will probably learn a great deal and establish a strong direction for subsequent development of a practical risk–reduction strategy (please see figure 22–5). Figure 22–5. Photo. An assessment of potential liability is the first step toward a proactive position. Let’s look for a moment at a recent case study from Scottsdale, Arizona, which has historically been a leader in the provision of bicycle facilities. Since the early 1970s, an extensive and popular multiuse pathway system has evolved—a north–south spine through the most populous part of the city. The paths are used by many commuters, but were designed primarily as recreational facilities. They are now 15 to 20 years old. Some portions were built to standards that are now outdated or are more appropriate to pedestrians than to bicyclists. Use of the paths has increased, along with potential conflicts and the diversity of users. There have been crashes and lawsuits filed. Detailed documentation of existing conditions. Review of applicable standards and criteria. Analysis of existing conditions in the context of these standards. The comment is sometimes heard that if all these potential hazards are identified, then the agency’s liability may increase since the agency can be shown to have been aware of the hazards without correcting them. Are you really less vulnerable if you don’t know what the problems are? In a word, the answer is "no." It is not quite as simple as that, but the following is a summary. What if you don’t know about a potentially hazardous condition and an injury occurs? The success of your defense may, in part, depend on how discoverable the condition was. The question is often asked, "Did the agency have time to discover its error?" If a crash happened during the first week this condition existed, there might be a strong defense since there was not sufficient time to discover the error. If two years had gone by before the crash, most courts would rule that there was plenty of time for the agency to discover the condition and correct it. Sometimes a condition is so patently unfair to the public that an injured party will bring a suit where he or she would normally accept most of the blame. For more than 15 years, bicyclists have been fighting governments that have tried to keep them off of the roadway. If a pedestrian were injured by a bicyclist on a sidewalk, one or both parties might file a case against the government for forcing the bicyclist into a space that does not provide reasonable and prudent sight distances, operational widths, and which now violates many laws, design standards, and accepted practices. Example Case 9. In the case of Walden v. Montana, a bicyclist descending an interstate ramp into Great Falls, MT, was drafting two fellow bicyclists at high speed. At the pinch point, where the guardrail and the lane narrow, the bicyclist came alongside his friend. The friend moved out from the guardrail, forcing the cyclist into the seam separating the travel lane from the ramp lane. The cyclist hit the lateral seam and crashed, landing on his head at more than 56 km/h (35 mi/h). Was Montana responsible for maintaining a concrete/asphalt joint to meet the needs of the bicyclist on an interstate? This case was tried and the defense won and the verdict was upheld in the State Supreme Court. They determined that the bicyclist contributed significantly to his own injury. The highway department had a serious uncorrectable groundwater problem that made it difficult to maintain a better joint. The joint met AASHTO standards for preventing tire scuffing and vehicle deflection problems at such a location. Signing the specific nature of the hazard for a bicyclist, who would normally stay on the 3–m (10–ft) shoulder, was not required to meet the standard of ordinary care, which requires highway professionals to design, operate, and maintain highways for the reasonably prudent traveler. What if you have been made aware of a potentially hazardous condition and an injury occurs before you have taken steps to correct the condition? Agencies have a responsibility to fix problems, but the courts tend to favor good will and intent to find solutions, even if some conditions are too expensive to fix immediately. Again, a great deal will depend on the length of time that has passed between identifying the condition and the injury. If it can be shown that a reasonably short period has elapsed and that the agency or other party is taking positive steps toward correcting the condition, the defense position will be improved. For example, if a city conducts a study to identify areas of potential risk along a recreational trail system and does not have sufficient funds to immediately make all corrections indicated by the study, all is not lost. If a crash occurs, and the city can demonstrate that it has a well–documented program of risk reduction and that it has taken some interim steps (such as warning signs and markings) to alert trail users to potential risk areas, its defense is strengthened. If it has not identified potential risks and taken steps toward risk reduction, the city’s defense would be substantially weakened. Signing a hazardous condition has long been recognized as an important interim treatment for many conditions (see figure 22–6 for an example). Failing to sign a known condition is difficult to defend. Signing and warning offer two types of benefits: first, people are more cautious, so the number of crashes and injuries are reduced; and second, the attempt to alert the public about a potentially hazardous condition generates good will and makes it more difficult for a plaintiff’s attorney to argue that the plaintiff was surprised by the condition. Signing should make use of international symbols and follow the standard signing and marking practices found in MUTCD. What if you have identified a potentially hazardous condition and have taken steps to correct it? What if you have trimmed shrubs that blocked sight distances, widened a tight turn to meet AASHTO standards, and added adequate shoulders to a path and still someone loses control and is injured? Assuming the agency responsible for the path has carried out its duties using ordinary care in a responsible way, it would be more difficult to prove negligence. The burden of responsibility may well shift to the bicyclist or other injured party whose contributory negligence may have led to the crash. Many communities have implemented a special annual fund to attend to pedestrian and bicycling facilities spot improvements. They have asked bicyclists and others to alert them to any poor maintenance conditions (see figure 22–7 for example postcard). This fund and response system allows the cities to respond to a hazardous condition within 48 hours of discovery. Figure 22–6. Photo. 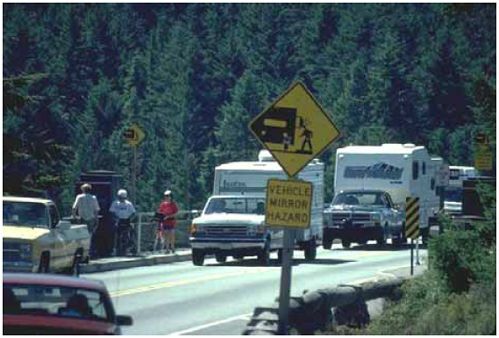 Use of signing to warn motorists and pedestrians of the potential hazard posed by vehicle mirrors on narrow bridge sidewalks. Figure 22–7. Photo. Example of spot improvement postcard used to identify roadway hazards. Several summers ago at a rest area on an interstate highway in the northern United States, a truck driver pulled his 18–wheeler into the truck parking portion of the rest area. The rest area was located on the side of a gently sloping hill. The truck parking area was at the bottom and the car parking area at the top. In between was the structure housing a travel center, vending machines and restrooms. The truck driver used the facilities and got a candy bar from the vending machine. As he descended the concrete stairs connecting the upper lot with the lower lot, he lost his balance and began to fall. He reached out to grab the handrail but the handrail was lying in the grass adjacent to the stairs. Unable to regain his balance, he tumbled down the stairs and landed on the sidewalk at the base of the stairs and which served the truck parking area. Although stunned and somewhat bruised, fortunately he was not seriously injured and was able to pick himself up. As he walked forward on the sidewalk, he brushed the dirt and debris off of himself and checked out the condition of his clothing and limbs. (He sustained ligament damage to his wrist and chipped bones around his elbow, both of which would have required medical attention. In addition, he severely tore his $5,000 Australian leather jacket). At the same time, another large rig had entered the truck parking area. Since the aisle between the sidewalk and the parking stalls was relatively narrow, the truck had to swing toward the sidewalk to get into the stall. As it swung, the outside mirror on the right side of the truck struck the right shoulder area of the truck driver who was walking on the sidewalk, nearly severing the arm from the shoulder. The victim was flown by helicopter to a regional hospital where the arm was reattached. The individual has permanent limitations on the use of his right arm such that he can no longer drive a commercial vehicle. The truck driver has filed against the State highway agency two lawsuits seeking compensation for damages and injuries received in the incident (for his medical and other bills and for his reduced earning potential due to the arm problems). The first suit alleges that the highway agency was negligent in its maintenance of the handrail on the stairs. Investigation revealed that because the handrail extended close to the sidewalk along the car parking lot, it was frequently struck by the bumpers of vehicles pulling into the parking stalls along the curb. Because of these frequent collisions, the handrail eventually failed and fell over, ending up in the grass. Two frequent users of the rest area gave deposition testimony that the handrail was lying in the grass for at least three months prior to the incident in question. The second suit alleges that the truck parking area was negligently designed such that it facilitated vehicle–pedestrian conflicts of the type which occurred. Highway agency records show that the rest area was designed in the late 1960s, when trucks were not as long or wide as they are today. 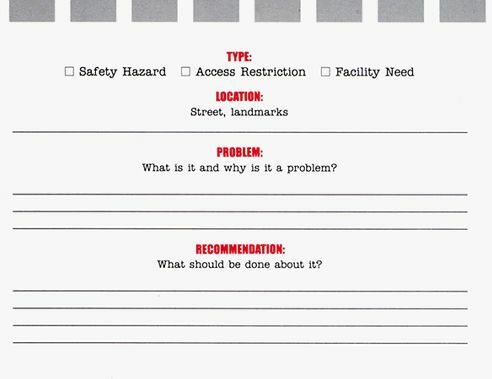 Records indicate that the 1966 AASHTO Design Standards for Truck Parking Lots at Rest Areas manual was used to design the parking lot and that the parking area met those standards. Records also revealed that, in 1985, the highway agency became concerned that the larger trucks found on modern highways were having difficulty maneuvering in the lot. The design division prepared plans for a larger truck parking area using space between the rest area and the interstate highway. However, the plans were rejected by the State environmental protection agency because the expanded lot would have adversely affected a wetland adjacent to the existing parking area. Records indicated that highway agency designers explored other options but simply could not feasibly enlarge the truck parking area without damaging the wetland. Assume that you are a noted transportation consultant specializing in pedestrian safety. The highway agency retains your services to evaluate the circumstances surrounding these allegations. The attorney for the highway agency wants to know whether in your professional opinion the plaintiff has valid cases. Question 1: Does the plaintiff have a valid case relative to negligent maintenance of the handrail? Why or why not? If your answer is yes, what risk management lessons can be learned from this lawsuit? Your response should be discussed in general terms so it would be useful to any facility manager. Question 2: Does the plaintiff have a valid case relative to negligent design of the truck parking area? Why or why not? If your answer is yes, what risk management lessons can be learned from this lawsuit. Your response should be discussed in general terms so it would be useful to any facility manager. "This Week’s Survey Results: Traffic/Highway Tort Liability," Urban Transportation Monitor, Burke, VA, July 20, 2001, pp. 8–11. A Policy on Geometric Design and Highways and Streets, AASHTO, Washington, DC, 2001. MUTCD, FHWA, revised edition, November 2003, Washington D.C., Available online at http://mutcd.fhwa.dot.gov/HTM/2003/html–index.htm, accessed February 25, 2004. Drake, B., Scottsdale Bicycle Path Improvement Study, Gruen Associates, Los Angeles, CA and Baker Engineers, 1991. Vermont Bicycle and Pedestrian Coalition, Available online at http://www.vtbikeped.org, accessed May 17, 2004. Student Exercise courtesy of Ronald Eck, West Virginia University, Morgantown, WV. Drake, B., and D. Burden, Pedestrian and Bicyclists Safety and Accommodation Participation Workbook, NHI Course No. 38061, FHWA–HI–96–028, 1996. Glennon, J.C., Roadway Defects and Tort Liability, Lawyers & Judges Publishing Company, Tucson, AZ,1996. Lewis, R.M., Practical Guidelines for Minimizing Tort Liability, Report CP–K14, Criterion Press, Overland Park, KS, no date. Managing Highway Tort Liability, NCHRP Synthesis 206, Washington, DC, 1994. "Tort Liability of Highway Agencies," Selected Studies in Transportation Law: Volume 4,NCHRP, Washington, DC, 2002.